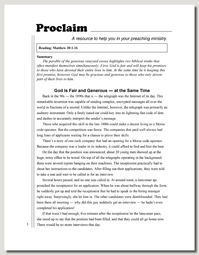 Proclaim is a leading resource used by thousands of pastors to help them with their preaching ministry every Sunday of the year. Our sermons are freshly written by our renowned staff of writers, based on the lectionary calendar, timed to today’s concerns and are always biblically relevant. Our illustrations provide a valuable alternate idea to spark your creativity. All are available to you right here on this site! If you’re like other preachers, preparing a sermon can take hours of research, writing and editing. A tremendous amount of time is spent developing each sermon from scratch. Our experienced team of pastor–writers has assisted thousands of preachers in developing inspirational sermons for over 40 years. Our preaching resource will save you time and help you deliver inspirational sermons every week! You’ll have more time to study and prepare to maximize your impact! 1. A new, freshly written sermon every week, plus many special holy days, as well as Thanksgiving, Father’s Day and Mother’s Day, professionally written by our renowned staff of pastor–writers! You can use the sermons just as they are, or you can edit them with your own thoughts and local references. Or, use each week’s sermon as a valuable thought–provoker for an entirely new sermon! They are ready to download instantly ... start editing right away in your favorite word processing application, or print out in the traditional, attractive format. They are always available three months ahead of time. Take a look at the upcoming sermons. You can also download them all at once (in both MS Word and text formats) to take with you when you are not online! Power Search! Looking for alternate sermons? Power Search provides them instantly by searching the archives for the same reading or liturgical date as the current sermon. Click on the icon! Expanded liturgical information for added convenience, including liturgical colors and links to appropriate lectionaries. (You must be logged in.) Take a look at it in our sample sermon. 2. Each sermon includes ProclaimClipArt that coincides with the liturgical date, designed to be used in your bulletin. Clip art is instantly downloadable for easy pasting in your bulletin publishing software, or can easily be printed. Click on the icon! 3. NEW! The Bulletin Toolkit Do you need help finding compelling, inspirational content for your bulletin, newsletter or other communication? Well, we listened! The Bulletin Toolkit provides a wealth of resources to enhance your bulletin, newsletter, emails, website or letters. Each month, we provide you with Reflections, Quotes, Stewardship thoughts, Prayers, Humor, Gospel Shorts (helpful summaries about the Gospel readings during the month) and even Cartoons! All easy–to–use right here. 4. A fresh illustration each week! This provides another idea to serve as an example or spark an alternative sermon. Check out this week’s illustration! 5. Complete, searchable access to our archive of thousands of Proclaim sermons and illustrations. Search various ways for both sermons and illustrations! ProclaimClipArt is also available in the archives. Search sermons now! Search illustrations now! 6. My Sermon Notes! Create handy, private notes on any sermon just like a post–it note. Keep a sermon rating too. 7. Easy–to–read feature! Prefer a larger font? View or print in larger type! Check it out! 8. Easy–to–use site with great features for printing, setting account preferences, such as default lectionary (RCL, LFM, BCP, LSB), sermon type size (Normal or Large), or to receive previews of upcoming sermons. 9. iPad and tablet friendly! Work while mobile! The cost is minimal! A one–year subscription is just $59.95 for 60 freshly written sermons, including ProclaimClipArt, a new illustration each week, and searchable access to thousands of professionally written sermons and illustrations! That’s only $1.00 per week!